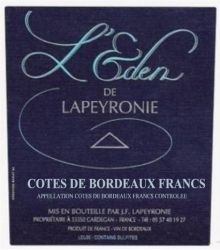 This current owners Helene and Frederic Lapeyronie represent the fourth generation of winemakers in the family. Frederic is the vineyard manager, Helene is the winemaker. She also teaches viticulture and enology in Saint Emilion. The estate, which belonged to Frederic's family, is located on a 2.5 hectare vineyard (6.2 acres) in Cotes de Castillon AOC, on a slope situated at 86 meters above sea level, with southern sun exposure. The soil is a mix of clay and limestone. The average age of the vines is 40 years old. The vineyard is planted to Merlot, Cabernet Sauvignon and Cabernet Franc. They also have 2.5 hectares (6.2 acres) in Cotes de Francs AOC, on a slope situated at 77 meters above sea level. The soil is a mix of clay and limestone. The average age of the vines is 35 years old. The vineyard is farmed using culture raisonée method, guyot double, disbudding, thinning out of the leaves, and fertilization. Manual harvest. Only the best grapes are selected. Production: 2,200 cases.